The rewards of yoga are plenty, and the tend to change over time with a consistent practice. At first, yoga’s benefits may seem strictly on the surface with the physical practice (Asana), like being able to touch your toes. Yet with time, these benefits can go much deeper. The more you practice yoga, the more you’ll notice the rewards in your life, including: a calm mind and reduced stress. The American Psychological Association (APA) defines stress as, any uncomfortable emotional experience accompanied by predictable biochemical, physiological and behavioral changes. Any situation the body perceives as dangerous or threatening triggers the stress or “fight or flight” response in the body. This threat may be overt physical danger or more subtle, dealing with interpersonal conflict such as a disagreement with a coworker or situational pressures, like a deadline or coping with financial problems. The body’s efforts to deal with a threatening situation cause a series of reactions. The heart accelerates to provide maximum oxygen levels to organs and cells. The muscles tighten and shorten to prepare for action, to maneuver through the situation, to fight or to flee from the danger. Adrenaline courses through the body heightening awareness and providing a quick burst of energy. The automatic stress response serves a purpose. It protects the body. However, chronic stress, remaining in a constant stress response state for a prolonged period of time, takes a negative toll on the body. It causes physical and psychological distress, which affects a person’s overall health and well-being. 75 to 90 percent of all doctor’s office visits are for stress-related ailments and complaints. stress is a significant hazard in the workplace and results in costs of over $300 billion annually. The digestive system may experience stress as stomach aches, nausea, and intestinal irritability. Mentally, a person under chronic stress may experience racing thoughts, unreasonable worrying, lack of focus and disorganization and pessimism. A person under chronic stress also displays emotional and behavioral markers of the condition. They may become irritable, experience feelings of overwhelm, anxiety, depression and low self-esteem. Stress associated behaviors, overeating or undereating, avoidance and displaying nervous behaviors like nail biting and pacing emerge under chronic stress. Physical stress related symptoms can occur in different parts of the body. When the muscles shorten or tighten to prepare for action within the stress response then remain that way, it causes tension and tightness in different parts of the body. Where muscular tension presents itself while under stress varies from one person to another. Some people may clench or tighten their jaw causing pain and discomfort in this area and possibly across the forehead and scalp. Other people hold tension in the shoulders and neck. Some people may find themselves experiencing chronic backaches. 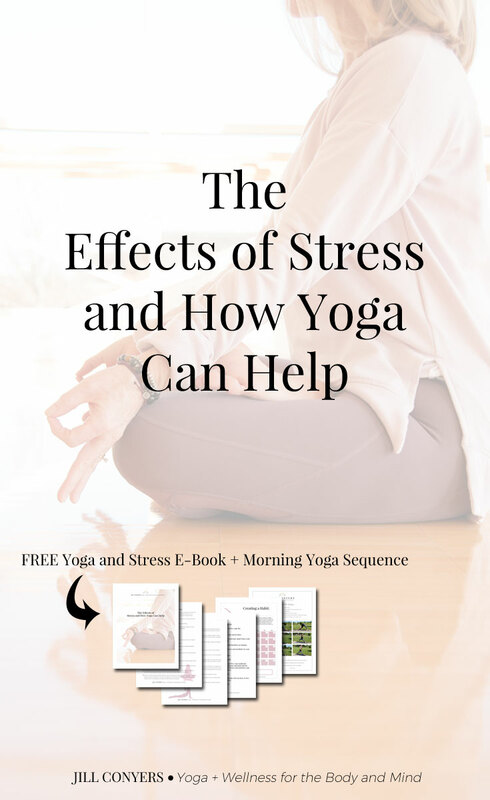 Harvard Medical School reports, available reviews of a wide range of yoga practices suggest they can reduce the impact of exaggerated stress responses and may be helpful for both anxiety and depression. In this respect, yoga functions like other self-soothing techniques, such as meditation, relaxation, exercise, or even socializing with friends. Essentially, yoga acts as a therapeutic antidote to stress; it provides physical, mental, and emotional relief to people experiencing chronic stress. Relief occurs during the actual yoga practice and the benefits continue to present beyond sessions when a person practices yoga consistently. Yoga poses ease stress related aches and pains due to muscular tension. The yoga poses stretch, lengthen, strengthen, and relax tense muscles. The meditation and breathing exercises calm the mind and the nervous system. They also allow a person to reestablish mental focus and clarity during and following practice. The breath work and poses practiced during yoga elicit the relaxation response in the body, which helps to decrease and regulate stress hormones. It is also important to note that yoga has a profound effect on various aspects of one’s health, including the ability to lower blood pressure, prevent heart disease, help regulate blood sugars in diabetes, and decrease anxiety, all of which are commonly elevated with chronic stress. If one intends to develop a yoga practice as part of a stress management plan, consistency is key to success. Yoga provides progressive therapy. The poses reshape and improve the health and functionality of the muscles, the joints and organs over time; it is a form of training and as with any training, regular practice sets the stage for progress. This also applies to the meditative and relaxation exercises associated with the practice. According to Dr. Debra Fulghum Bruce, PhD, recent studies show as little as three months of weekly yoga practice, relieves stress related headaches, backaches, reduces stress, and lowers cortisol (stress hormone) secretions. It also lowers blood pressure and improves participant’s mood. Practicing yoga has been shown to relieve the immediate symptoms of stress related aches, pains, mental distress, and negative emotional states. It also appears to effectively counter the fight or flight stress response by lowering cortisol levels and teaching the mind to observe (through meditation) rather than react to situations. People experiencing chronic stress can benefit greatly from incorporating a yoga practice in their health regimen. Improving lifestyle and behavioral choices are essential steps toward increasing overall health and avoiding chronic stress. Taking even small steps and making changes to reduce your stress and improve your emotional health can have a beneficial effect. Being active is a small but powerful change you can make to manage stress. The practice of yoga helps destress your whole self, dissolving tension as you move easily through the flow. Yoga poses will get your body moving, allowing the tension to roll right off. What is your go-to stress buster? I’ve been practicing more yoga lately and it’s life-changing! I definitely feel more centered and at peace after each practice. I need to start doing yoga when I have a stressful day. I’ve never thought of doing that would actually help with that. I do tend to get stressed out easily. I found that yoga helps quite a bit. Highly recommend to everyone. yes and yes to all of the above! I have absolutely no doubt in my mind that yoga would help stress! It’s time for YOU to be alone with your own thoughts and gain perspective! This is such helpful information! Thanks for sharing your tips! Great article Jill! I NEED to add more yoga into my life. There are so many benefits and I could definitely afford to improve upon my flexibility! I love yoga, it is a great time for me to stretch and clear my mind. These are great tips. Thanks for sharing. Yoga was a real blessing when i was pregnant. I definitely need to get back into it. It was such a good habit! I love this! I think yoga is such an amazing practice! It has helped my running, pre, durning and post labor and just relaxation in general! I will forever do yoga! I am a HIIT girl but I really want to incorporate more yoga into my routine for all the reasons you talk about above. lol! Thanks for the reminder of everything I am missing by not doing it! Great post! I’ve loosely tried yoga in the past, but I really want to try again and semi-commit to it. I think it may be the last piece to my stress management. There are so many benefits of yoga. Thank you for the reminder! 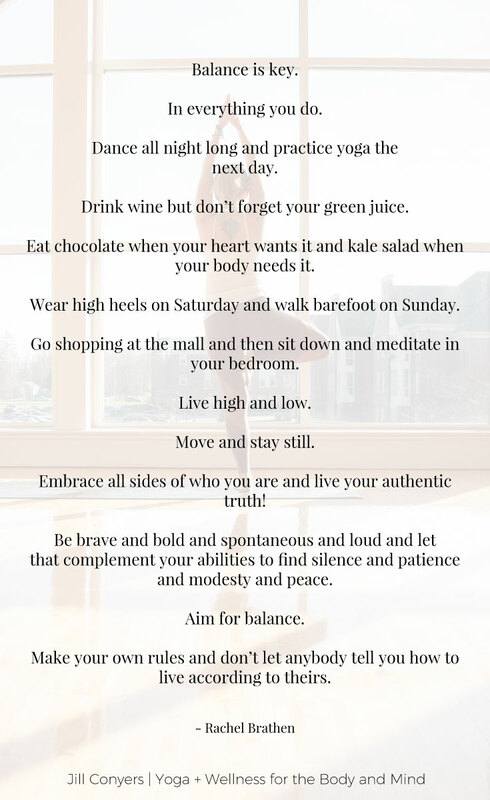 I LOVE the one about wearing high heels on Saturday and walking barefoot on Sunday…That’s how I roll…As you know, I love yoga and the benefits are truly amazing both physically and mentally. Namaste!